More diversity in agriculture means less efficiency, but can increase earnings in the end because it prevents diseases and increases resilience. This dilemma is being studied at a new test location. The new 80-hectare Agroecology and Technology Test Location opened near Lelystad in September. Here, crop scientists and technologists collaborate on developing resilient agricultural systems, with as much biodiversity as possible, minimal loss of nutrients through runoff, and minimal use of chemical crop protection. In conventional agriculture, with monocultures on large fields, diseases, pests and weeds can spread fast. Farmers do not grow the same crop in the same field every year, but rotate their crops to keep their soils healthy. According to Sukkel, more variation is needed, not just over time but also in terms of space. One way of achieving this is strip cultivation, in which crops are not grown in large monocultures but in varied strips of between 6 and 12 metres wide. This generates more biodiversity in the field, with more natural enemies such as spiders and beetles that eat a lot of destructive aphids. This reduces the number of diseases and pests. Big, heavy machines, which ruin the structure of the soil, make way for small, autonomous machines such as the spraying robot, which only sprays when it sees a weed, instead of spraying the entire field. 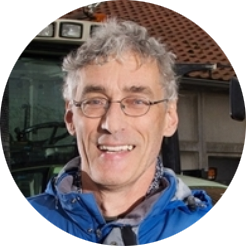 Wijnand Sukkel works on this research with a team of scientists and business units from Wageningen University & Research and the Netherlands Institute of Ecology (NIOO-KNAW) in the areas of crops, sustainable agriculture, ecology and environmental sciences. In mechanization there is a trend towards precision agriculture in which the land can be tilled metre by metre. This creates new opportunities for mixed cropping, with different crops growing side by side. Organic farmers already work with combinations of grass and clover that help keep the soil healthy. And an advantage of grass and clover is that they can be harvested together. Another interesting option is agroforestry, in which fruit or nut trees are combined with a field crop growing around them. And if the fruit trees are planted further apart, diseases will spread more slowly. For other forms of mixed cultivation, mechanization is still a sticking point in modern western agriculture. A farmer could grow several crops with differences in resistance to diseases and in root penetration. Deep roots are handy during drought, and shallow roots are better during flooding. Scientists and plant breeders are discussing the options for breeding for resilience. Thanks to the ever heavier agricultural machinery used on Dutch fields, the soil is becoming increasingly compacted. This causes harvest loses and rainwater does not penetrate the ground as well. If there is heavy rain, the land is covered in puddles and in times of drought, the soil supplies less water. To reverse the trend, experiments are going on with non-inversion tillage, a method in which the soil is not ploughed but only the top level is loosened up. This causes much less disturbance to the soil life in the topsoil, and the land suffers less from both heavy rain and drought. Economic resilience is important too. On the peaty soils of the Netherlands, farmers grow starch potatoes, sugar beets and summer barley. If farmers swap summer barley for marigolds, they make a loss because barley earns them money and marigolds do not. But those marigolds quickly make the soil so much healthier that the potatoes then bring in much more, and that makes this combination lucrative after all. Another example is provided by sugar beets, which perform well in strip cultivation. In a sugar beet monoculture, aphids that carry the yellowing virus cause spoiled harvests on a large scale. In strip cultivation, the aphids do not spread as fast. Yardsticks such as: is the farming system sufficiently diverse? How dependent is it on external inputs such as artificial fertilizer and chemical pesticides? Does the farm generate its own energy or is it dependent on fossil fuels? Is it extremely dependent on just one client?